Google’s first reference mobile, the Galaxy Nexus S, is seen in this file photo. Samsung tested its single-chip solution in the long-term evolution-enabled Nexus S. Samsung aims to grow as a solutions provider by strengthening its capability to produce telecom chips. Samsung Electronics will use its single-chip solutions for its next smartphone, the Galaxy S III, to lower dependence on U.S. chipmaker Qualcomm. The move comes as Samsung, the world’s top memory chipmaker, aggressively shifting focus to more profitable and less-volatile non-memory chips. Memory chips like DRAMs and NAND flashes are used to read and write data with these chips being commoditized. Thus they are cheap, compared with non-memory chips. Non-memories are to control an entire computing system and require advanced chip-making technology. ``Samsung’s single-chip solution is a combination of long-term evolution (LTE), telecommunications and W-CDMA functions,’’ a high-ranking company executive said Monday. 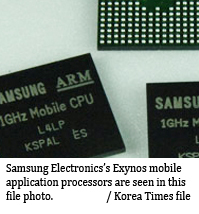 The firm’s Exynos-branded quad-core mobile application processors (APs) are to be equipped in the Galaxy S II’s successor, according to the executive. ``We don’t think there will be big technology-related problems as we have already tested our telecommunications chips in some smartphones and tablets for consumers in North America. 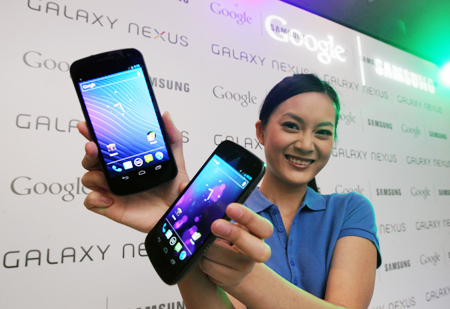 Also, Google’s first reference mobile, the Galaxy Nexus, is using Samsung's telecom chips,’’ said the executive. ``Samsung has a stronger intent to lower its dependence on Qualcomm and our technicians believe that we have made significant progress in producing logic-based chips for high-end devices, combined logic and memory chips for graphic controllers and core communication chips for Internet-enabled consumer devices,’’ said the executive. Amid the explosive growth for LTE-enabled smartphones globally, the decision could hurt San Diego-based Qualcomm in the mid- to long-term, according to analysts. ``Samsung is paying huge amounts to Qualcomm in return for using its single-chip solutions in strategic digital devices, however, Qualcomm is gradually losing its edge,’’ said another Samsung executive. Both executives asked not to be identified as they don’t have the right to officially speak to the media. Samsung, which was the world’s biggest smartphone seller last year, plans to sell 250 million smartphones this year, up 25 percent from its earlier target of 200 million. So far, Samsung Electronics is an earnings propeller for Qualcomm because the American firm was the sole provider of one-chip solutions. ``It was believed that Qualcomm chips had greater stability and suited easy upgrades. But, that’s the old story,’’ said the Samsung executives. To prevent Qualcomm from losing one of its top customers, it recently announced the launch of its fifth-generation Gobi reference platform that seeks to pack support nearly all major worldwide mobile standards into a single chip. Based on the company’s Gobi LTE wireless baseband modems, the MDM9615 and MDM9215 deliver fast LTE connectivity with backwards compatibility to both HSPA+ and EV-DO networks, Qualcomm insists. ``This will allow support for regional LTE frequencies with backwards compatibility to existing 2G and 3G technologies, allowing Gobi LTE devices to connect to faster LTE network locallys and stay connected to the Internet globally on 3G networks worldwide,’’ it added. 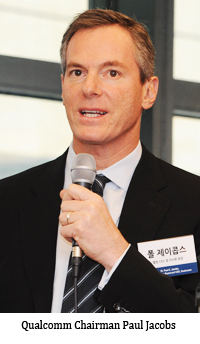 Both Qualcomm officials in South Korea, and Samsung Electronics spokesman Ken Noh declined to comment on the Korean firm’s plans. Samsung’s transition towards becoming a solutions provider and a chip supplier is strengthening as its mobile head Shin Jong-kyun is injecting more resources to expand the management of its own telecom chips. ``Our division is not just to produce smartphones and tablets. In order to diversify portfolios, our division should do better for telecom chips,’’ said Shin. The chip division is handling mobile APs and the head of the company’s device solution unit, which encompasses flat-screens and memory chips, recently told The Korea Times that its mobile AP-making factory in Austin, Texas, became fully operational last year. Apple’s i-devices use Samsung’s mobile APs produced at the Austin plant. The Exynos chip is currently built using a 45-nanometer process but the new Exynos chip will be made with 32-nanometer technology, giving better performance quality without using as much power. Samsung said that in terms of performance, it gives up to 26 percent more than the current 45-nanometer chip, with battery life improved by half. The new version will be used in the Galaxy S III. This in itself is good news for consumers who rely on battery performance when choosing devices. ``The development of quad-core mobile APs is finalized and the decision to make one-chip solutions was by Shin,’’ said an executive at the company’s semiconductor division. ``If Samsung successfully strengthens its management for telecommunications chips, then it expects to see more revenue from smartphones and tablets. That’s the scenario we hope,’’ said the unnamed executive. Samsung has a cross-licensing deal with Qualcomm until 2024 to use the American firm’s single-chip solutions. Switzerland-based brokerage UBS has raised its target for Samsung Electronics shares to 1.48 million won citing a rising shares in smartphones.